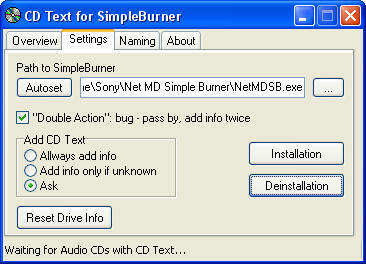 How to use "CD-Text for Simple Burner"
How to use the application "CD-Text for Simple Burner"
Please check, if you have a working "ASPI Layer" on your system. This layer provides various applications access to CD drives. Have a look at this nice page: http://www.nu2.nu/aspi/ or check the websites mentioned below. On XP you should make an restore point before installing one of the tools. If you just installed the ASPI layer, don't forget to reboot, as the system might crash if you don't. 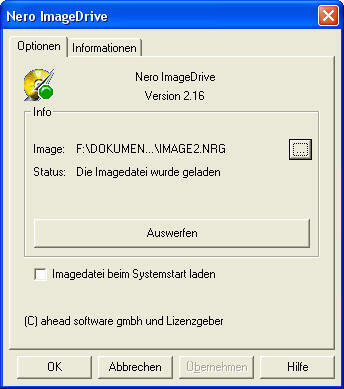 Additionally you may need the latest version of Nero ImageDrive (V2.16). 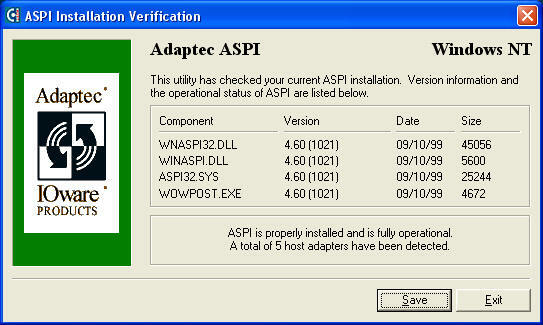 Important: "Force ASPI" must be installed after the installation of Nero-Imagedrive. If your image drive is not recognized by my app, reinstall the ASPI-Layer. If you want to know, what changes where made to a new build, read the ver.txt. Open the installed application and choose "Settings". My defaults are "Double Action": true, "Add CD Text: ask"
Open the windows control panel, choose "Add/Remove Software" and select "Uninstall"
Most time you don't need to uninstall an old version before installing a new version of the program. If this is necessary it will be noted upon install. I tested this with German versions of the application mentioned. Therefore some commands could be labeled differently than expected. 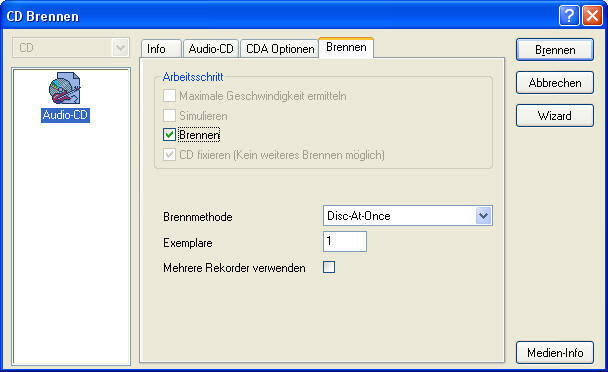 Select the virtual recorder ("Recorder/Selection") ("Rekorder/Rekorderauswahl", Ctrl+R). 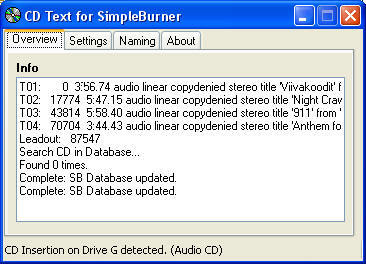 Select "image recorder"
"Burn" the CD image file. 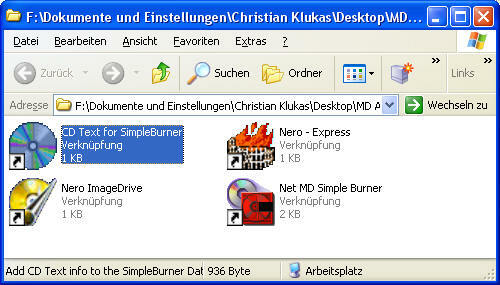 ("File/Burn CD") Nero will ask for name and path of the image. After burning has finished, close Nero. You do not need to save the compilation. Open the application "CD-Text for Simple Burner"
If you have disabled the Auto-Play function of Windows (VMware for example does this), then the insertion will not be recognized. 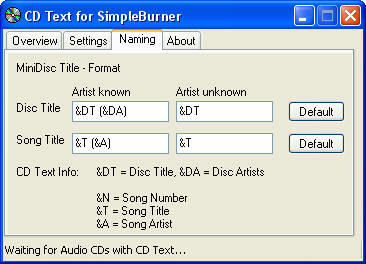 You should in this case start "CD-Text for Simple Burner" after you have loaded the image in Image Drive. My app (from build 33 on) will check all known drives upon start for an Audio CD. There might be the problem, that the drive will be unknown if Auto-Play is disabled from the beginning. The next version will therefore include an Drive-Selection. 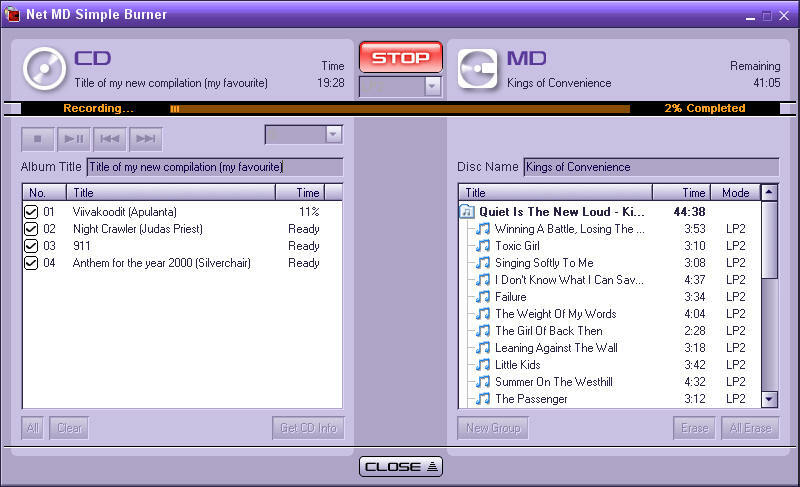 If you burn a complete CD there is a high probability that Simple Burner will recognize the CD even if your source are MP3 files. You then don't need to start my application. The maximum length of music you can transfer using this method is 150 minutes! If you want to transfer more than 150 minutes, you have to create 2 images.